Come October 30 and the 5,137-metre Buddh International circuit in Greater Noida, near Delhi, will be on fire. Ninety-six Pirelli tyres will singe the tarmac at the 17th Formula One World Championships, trying to wriggle their way around 16 corners 60 times to see the coveted chequered flag. The Indian national anthem will be heard for the first time in the F1 arena at 2.46 that Sunday afternoon. Vicky Chandhok will be there, and will be an elated man. Gone are the days when the current President of the Federation of Motor Sports Clubs of India had to pay Doordarshan for a two-hour slot to bring the world's richest sport to Indian viewers. "That was the first time in the history of F1 that somebody had to pay for telecast," says Chandhok, whose son Karun is the Indian F1 driver of Team Lotus. How times have changed! According to media reports, ESPN has sold out its inventory of 800 advertising seconds during each race, at Rs 1.5 lakh per 10-second slot. "After the Olympics and the FIFA World Cup, F1 is perhaps the most watched sport globally," says Karun. Viewership has risen steadily in recent years. Formula One Management's figures say TV viewers increased from 520 million in 2009 to 527 million in 2010, spread over 187 countries. Coverage hours rose from 14,500 in 2009 to 16,000 in 2010. Much of the excitement is about corporate patronage. For example, Vodafone, which has partnered with the McLaren Mercedes team since 2007, is looking forward to the event in India, where it has the second largest subscriber base. "We hope it will mark another step in building stickiness with the fan base," says Anuradha Aggarwal, Vice President, Brand Communication and Insights, Vodafone India. 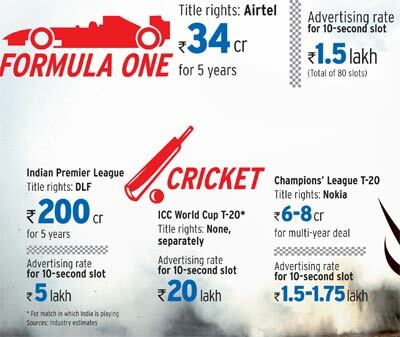 Some of the money has come F1's way at the expense of cricket, a sport so dominant in India that it leaves little room for others. Airtel bagged the title sponsorship of the race for about $7 million (Rs 34.4 crore), according to media and industry sources. Not long ago, it walked out of its title sponsorship deal for Champions League Twenty20 three years early, and may be patting itself on the back, given low viewership. "Unlike cricket, F1 caters to the top of the pyramid, and marketers seek qualitative returns," says Punitha Arumugam, CEO of media-buying agency Madison. Mohit Beotra, Head, Emerging Business, Bharti Airtel, concurs. "This sport is relevant to India, especially given the 14 per cent growth in the $40-billion sports marketing business." It may be a good time for cricket's rivals to take the crease. The recent battering of the Indian cricket team has won it no new fans. But the true test for other sports will be when the IPL money-spinner comes around.